"Girls, I think you just made history!" 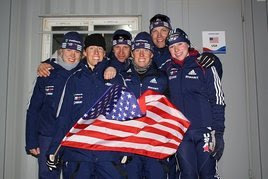 US Biathlon Executive Director Max Cobb proclaimed after the finish of the women’s relay during the World Championships in Korea. And they did: Finishing 10th in the relay competition in front of World Champion Norway really made the whole team proud. It was the best World Championship relay finish for the women since ninth place finish in 1997. In the wax room, post race. Putting a "good luck wish" for the women's team on top of Dragon Mountain above the resort and venue this morning. Thursday was a day off, and a day to venture outside of the racing world to see some Korean culture. A few buses and a taxi later, Lanny, Tracy and I arrived at the Woljeongsa Temple. One of the most holy Buddhist sites in Korea, the Temple has a 1300 year history. In an hour, we saw merely a small part of this complex which consists of 60 temples, hermitages and a museum, all nestled in the Odea National Park. The main historical artifacts of this Temple are the seated Medicine Buddha, who appears to be giving an offering to the 9 story stone pagoda. It was cool and quite here, and in the background you could hear the rhythmic sounds of a meditation session in the Main Hall. Various other Halls also had shoes lined out the side, and their doors closed. To have only ever read about the Buddhist religion and growing up in a Catholic school, to feel, see, hear and touch the real thing was quite special. The "hipped" and gabled rooves and their intricately crafted and painted eaves were beautiful. Every availible log or paneled space was devoted to a painted story, bodhisattvas (one who has found Enlightenment, but has remained on Earth to helps other achieve this state, similar to saints), symbolic flora and fauna, and decorative designs. "For peace, health and happiness for my family." Tracy and I leave a rock - a wish - on this growing alter. The detail and the colors of the Temple were fantastic. As you walked closer to the walls and spent time looking into the eaves, the details almost multiplied. It was invigorating to experience a cultural site so different from what I have seen in Europe and in North America. Religious sites, like churches, usually dominate the cultural exursions that I take when traveling, and this is the first time that I have been to a genuine sacred Buddhist site. In contrast, two weeks ago I stood Siegsdorf's (where I was for the Pre-Champs training camp and the stomach bug) Catholic church with heavily decorated altars, walls and ceilings, and the week before that in Zurich a stone, spartan Protestant church built during the Protestant Reformation (16th century). We watched and happened to follow a family and their small son (see his shoes above) giving offerings and prostrating towards various Buddhas and bodhisattvas. We completely distracted him from following his parents, as hard as he was trying, bending and bowing is not as easy when you are only two feet tall and bundle in winter clothes. I wish I had captured his smile in there. It was priceless to watch his bouyant joy and his devout parents, all within the gaze of a massive gilded Buddha and alter. I could have spent all day there and am bummed my camera died, becuase the creativity, design and effort put into this place was refreshing and enjoyable to experience. I've read more about Buddhism in the past couple of years (Zen and the Art of Archery and Buddha In The World) lately because I like the perspective it brings to the sport that I am doing. I find there is a constant tension between serving your self and serving others, achieving fame and success, but also find content in your best effort no matter what the result. And, being in the "zone" is almost a form of being enlightened. It is not a chance state, there are so many ways to reaching it that take time, awareness, patience and discipline. The right way. After a short taxi back to a hotel, we had some time to kill before catching a bus back to our hotel. We came across some Korean delicacies in the hotel lobby, like this Ginseng drink below. Look closely and you can see the whole root in the bottle. And with nap time approaching, potentially low blood sugar by this point in the day, combined with a giddiness from getting out of the hotel, we seized the opportunity to make fun of the empty pool outside the hotel. Cannonball? I have yet to really expound to many the full details of what it is like to race a Biathlon World Cup or Championship event, so in lieu of summing it up in a paragraph and say the race was good or not so good, below are the details to my World Champs Individual race. The Individual race was really not on my radar this past week; I am usually miss a lot of targets in four stage races, my last three Sprint races I had a 40-50% shooting percentage, and I have been struggling with my shooting process in training, in racing and in my head for two months which climaxed in what felt like one of my worst races ever in the Sprint. I was actually thinking about the possibility of racing the Mixed Relay instead and use it to prepare for our women’s relay. But, then I was guaranteed a start spot. So, I put myself back together as best I could, headed back out to the range on Sunday afternoon for training. The gusting Korean wind was relentless and difficult for me to shoot in. On the range I left no more confident or reassured. Something needed to happen, was really all I could feel. On Monday morning I set up a meeting with Per, my coach. An hour and a half later after discussing, writing things out, even drawing it out (the note paper with the target and the right sight picture drawn on it still sits on the kitchen table next to me) we were able to come to some conclusions about my shooting process, where I had derailed, and how that afternoon and the following training sessions I would begin to get back on track. Aiming (go figure), “Forward and Inward” as Per would say, and seeing the whole sight picture is my new focus. Also, often a race analysis is concluded by “what if you hit all of your targets?” and the subsequent math is done to estimate a new result with my already established ski times and better shooting results. It gives a glimpse of what is possible someday. 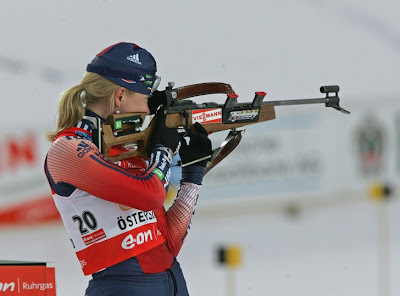 Often, this gives hope and direction, without being false hope because in biathlon the math is objective – a 1 minute penalty for each shot is pretty clear - and that perspective helps balance out the subjective experience. I finished my pre-race session, intervals done, course inspection successful, and skis tested. My shooting was mediocre and I was not as satisfied as I would have liked to have been. The overriding feeling however was more optimistic – I have done what I can do, the best that I can do, so now we will just have to see. The race was rather late on Wednesday night. With bib 63 I didn’t start until 6:45pm. But the day went smoothly and was relaxing. By the time I arrived at the venue I was ready to go. Zero went well and I left with a strategy if the wind picked up during the two prone stages and I would need to adjust my sights. I discussed with my wax techs, Andi and Gara, about shortening my ski testing before the race. (I feel great racing Gara on the course, but then don’t feel so great once I actually have to race.) We have some great skis for this these conditions and testing has been quite clear each day in these dry man-made snow conditions. I also trust these guys a lot, and Gara fully understood, today I needed to focus on shooting and he would take care of the skis. I proceeded to dryfire to “warm-up” for shooting you could say, and then went for a run to warm up for skiing. The warm up track was washed away in the rain last week, and I actually find running (dynamic stretching, sprinting, skipping, etc.) to be a more effective anyways. 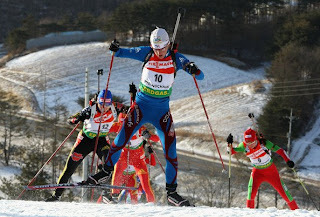 The Individual race is the longest event with 5x 3km loops, four shooting stages, prone/standing/prone/standing, a minute penalty is added for each missed shot and race ski times range from 40 or so minutes to an hour long. The women’s world cup field is a very competitive shooting group too, often besting the men in most conditions. With that, I knew this race was only about what I can do with what I have got right now, and it is not a comparison to the field. The PyeongChang 3km course is also pretty tough and demanding. It is dominated by two big uphills, a lot of transitions, and (what can be) a difficult downhill that rockets you into the stadium. I arrive at the start with the right amount of time to jog around, undress, get a transponder and get in line. Start line jitters were adverted when I spent time looking for #62 from Moldavia to show up to start in front of me. At the start line I always like to think of my family, huddled in the dark to the glow of the computer screen watching and waiting 1,000s of miles away. Just as any other race I had cue words picked out for my skiing, my shooting and my mind, that I hang around me like an aura. I don’t say them over and over, or keep them in a certain part of my mind, instead keep them on the periphery and call upon them when I need to, or when I’ve picked certain spots on the course to transition my focus from skiing to shooting for example. As smoothly as the rest of the night had gone, I started. Coming off of a disjointed and frustrating Sprint race a few days prior, I knew I needed a new way of thinking about racing. This time, I was creating something, lap by lap, shot by shot. Each lap had a necessary part - the first hill, then the second, and each shot had a number, one, then two and so on; focused on the task at hand, while at the same time creating the race. With this perspective, I found a rhythm and went with it. Each lap was solid. I passed Bernd, our team manager (of everything), on the first hill, who watches the time splits online and reports to the rest of the course coaches. He maintained his half-English, half-German cheering and coaching until the last lap where he exuberantly gave me the time gap of 2 seconds to 18th place. As his voice faded (probably because I just gave him his sore throat back that he has been trying to fight off) I would pass Max, our Exec. Director working out on the trails this week. His job was to relay to us our prone shots from the first stage. On a small target board he shifted the magnet white dots into formation. From that picture I could determine where hits and misses were and decide whether I would need to change heading into the second prone stage. On the next hill, I would pass Gara, an intimidating-looking Czech guy who actually is really nice and very good to test skis with. The middle of the course was mine and I felt like I climbed the big hill well. On the 4th and 5th laps I kept pace with a Norwegian and a Czech (who was leading the race at that time). Nearing the drop into the stadium I would take my feeds from Patrick and get another cheer before the shooting range. Before taking a 180 degree turn into the stadium there is a long V2 alternate stretch that is ideal for taking in deeper breaths to trigger the calm before shooting. Stage by stage I was dumbfounded by the fallen targets: I cleaned [hit all 5 targets] one – okay good, that was nice to do – I cleaned two – Oh **** I have not done that in racing or in training in a long time! – cleaned three – no way, here we go! – last stage I missed the 4th shot high, but regained and nailed the 5th – I could have stopped right then and there, satisfied because to have hit all would not have been human for me to do. [Until I did that math afterwards and I could have gotten 13th.] Passing back through the stadium, forming the Norwegian and Czech trio again, I could hear Martin, our massage therapist and start guy, who because of his height and generous heart we affectionately call him Big Martin, yelling “Super, Super!” I had maintained a good pace throughout, so was able to push it on the last lap, yo-yo-ing between the Norwegian and Czech. Their power up and over the hills separated us on the final downhill sections nearing the finish. Thankfully the notorious downhill to the finish was in great condition and a bit of recovery was possible. Following Anne into the Finish, I slighted my eyes, thought “Kara - Lars” (my favorite team, and my brother and sister who slept on the couch to be able to get up to watch my race online in the middle of the night) and sprinted for the finish. The finish line, the fall line, the tipping point, whatever you want to call it brought about the biggest relief as I dropped to my knees and cried. I came across the line in 17th and after all 106 racers finished I ended up in 23rd – our top women’s result this year and the top World Champs women’s result since Rachel Steer’s 17th in 2005. Thanks for reading, thanks for everyones’ support and thanks for following all of us this winter. Tim Burke and Lowell Bailey will both compete in the Men’s Mass Start (top 30) and our Women’s Relay – Lanny Barnes, myself, Laura Spector and Tracy Barnes - are all this Saturday the 21st. 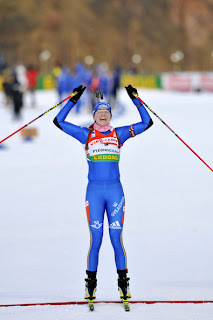 On http://www.biathlonworld.com/ all race replays are available. Pyeongchang is the "hub of winter sports" in Korea; I passed multiple signs and billboards while on the bus today that read Yes! 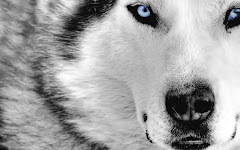 Pyeongchang!, Towards the Olympic Games, Remember, Dream of Pyeongchang! that remind everyone of PyeongChang's vision and passion for the 2018 Winter Olympics. I went for a run at the venue the other day and ventured down into the main ski jumping stadium. Like a jobsite in the spring after the winter thaw, the jumps, stands, landscape, and main building were littered with pipes, tarps, wood, railings, debris and bricks and a few jumps are still covered in scaffolding. In the background I could hear a table saw. 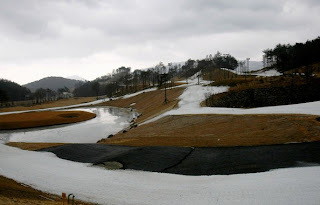 The dreary, rainy winter day juxtaposed to the continued work at the jump site illustrated the Koreans' collective drive, despite even a melting winter day, to build this venue to fulfill their vision of hosting nordic, biathlon and ski jumping events for Asia, and for the world. Here is Carolyn during training. We each have our own green women's "training bib" that we wear during each training session throughout the World Cup season. The men's are orange. Here is a look at the backside of the course. Oh yeah, we are racing on a golf course. It looks a little bit whiter now, but the rain last week hit the venue pretty hard. Squint, and you see that that is nearly 50 degrees F. The board on the left prounances an "Urgent Notice" about the closing of the trails to save the snow. The board to the bottom left is one of a few at the venue. The air and snow temperature at both the stadium and on the highest part of the course are recorded throughout the day. This is crucial information for our wax techs, who test skis and grinds throughout the day. This is a look down wax cabin lane. 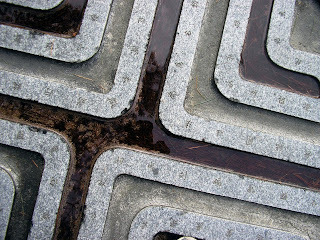 The puddles are now ice, as the temperature dropped to 20 degrees F and has been slowing climbing back up to the 30s and 40s. Lanny and I at the venue. Because of Korea's rules on firearms is very strict, we all keep our rifles in a storage room at the venue. For training, we have to sign our rifles in and out each time. Coaches and staff take care of the ammo, and in a similar manner sign out ammo and upon return after training, have each box counted to account for every single bullet. The following trail photos are from last year when there was a bit more snow. But with the recent colder temps and ability to recover the courses with man-made snow, race conditions are quite similar. To ski on manmade snow is just not the same. Undoubtably, it feels very different. Here, it is dryer - both the snow and the climate. Because of the changing temperatures and the dry wind, the snow on the tracks is icy, transformed, and sugary. When skiing on real snow there is a unique silkiness to the glide that is one of the best feelings in the world. Ah - Vancouver will be nice. This is the "big hill" on the course. This is what the "big hill" will look like during the Relay Saturday night, which does not start until 7:15pm. I will race in the second leg this time, starting after Lanny Barnes, around 7:40 or so. I can't find any photos of our crew racing, so here are a couple of some of the best in the world skiing, crossing the finish line, and standing on the podium. Okay - post #2, 3 and 4 are on their way. Hello from Korea! I apologize for falling behind in sharing with you the photos and stories of this past week's travels, racing and new location, culture, language, and food. This is the first in succession of posts that will hopefully fill you in on my time in Korea. Pyeongchang, the county that we are in, is located in the northeastern region of South Korea. Our overnight 9 hour flight from Amsterdam to Seoul, the capital of Korea, was smooth and similar to our North America to Europe flights. We left a mild winter climate in Germany and landed in what felt like a hazy, warm spring day in Seoul (Incheon/Seoul airport actually). On a peninsula with a coastal climate, Korea's winters are mild and relatively short. Flat coastal plains outside of Seoul and Incheon were punctuated by these high-rise apartment buildings surrounded by what looked like their agricultural resource - rows and rows of greenhouses. Our three hour bus ride through low-lying hills, we climbed higher in the Taebeck Mountain range. Crinkle a piece of paper, and then spread it out again; once in the mountains, this is what the topography of the land looks and feels like. The mountains/hills are not terribly high, but the valleys in between are narrow and marginally flat. The farmland, for example, looks challenging as each field is scooped out and sculpted, terraced and irrigated against the natural geography. Unique to this region because of the cold winds are "fields" of fish, hung and drying on racks, and wind farms. The fish are walleyed pollack and are specifically hung to dry and freeze during the winter months in the colder mountain valleys. I've checked them out in the grocery store - no thanks. And, from various spots on the course and from our hotel, you can spot large wind turbines in the distance. 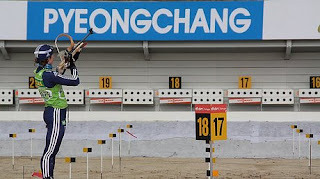 As a biathlete, you take note of the flags in the stadium and the flags in the range to gage the affect on shooting. But, to see monstrous wind turbines slowly spinning does not bode for a calm day on the range. At least I am not a ski jumper - to the left of the biathlon stadium are 5 ski jumps - and have to worry whether or not a gust will push me down or blow me away. A left hand turn up one of the valleys takes us to Yong Pong four-season resort. We are staying in a monstrosity of a hotel - GreenPia. It is by far one of our nicest accommodations, but this hotel is huge! And one of only many in this resort complex. I am on the 10th floor and am sharing a suite with Herbert, who competes for the Netherlands . This is the view from our balcony down to the ski area one evening during the full moon. And the mild winter I mentioned, I think it is mostly man-made snow on these trails, as is the same for our race courses. The Korean language is Hangul. Even though it looks similar to Chinese or Japanese to the western eye, Hangul is actually an alphabet, unlike Chinese characters for example. It is an alphabet unlike any other because it is not based upon another language and was developed in isolation. South Korea is also known as "The Land of the Morning Calm," except for here. I admit I as well as most of us sleep in here because of the late training and race schedule, I open my shades and windows each morning around 9:30am to hear the buzz of the ski hill below. Two sounds in particular are below. Air pressure hoses hiss and blow off the snow "debris" from skis, boards and boots, and one early morning I awoke to a chant. To get ready for the day, these ski instructors were stretching and chanting (counting?) in unison. Ornate lotus and floral designs dominate these small traditional structures. Looking closer into the designs, it is as if they are telling a story. A distinctive feature of a pagoda, or even the more traditionally built homes here, are the up-turned corners of the roof's eaves. Often, dangling from them are wind bells or chimes. The photo below illustrates the bend in the roof line, well it sort of does. Near, what I understand to be a Buddhist burial site, are these stones, which actually give you a better picture of their written language. Buddhism and Catholicism are the two main religions of the Korean people, whereas Confucianism and Korean Buddhism traditionally have a greater influence on the their culture, politics, and world view. By the end of World Championships, I will have probably eaten rice at least once a day for almost 14 days straight. There are two big crocks of sticky white rice on the buffet tables. Aside from the side "pasta station" most entrees (side dishes are what they are actually referred to because they accompany the rice) are meant to be served over or with rice. Plus, chopsticks are a lot more fun to eat with. And, add some warm milk, honey and cinnamon, and I've got rice pudding. I've passed over the big platters of raw fish for the most part, and still have not tried the the traditional Korean dish of spicy kimchi. It consists of pickled or fermented vegetables like cabbage, a "mountain vegetable" like daikon, sweet potato, potatoes, and garlic. But, I have really enjoyed the sushi, and the accompanying flavors of soy sauce, wasabi and ginger. Dishes like sweet and sour pork, and wild duck have also been good. I will have also gotten my fill of salmon by the time I leave too. Its all been a welcomed change of pace from heavy German meat dishes. And perhaps once the races are over I will being more adventerous at meal time. Perhaps one of my lasting impressions of Korea, will be the wind. There is always a breeze, a gust, a draft. A constant zephyr blows and howls here. I think these buttressed trees (which you see everywhere) are a better illustration than the wind turbines and my misses in the Sprint race. And secondly, the use and mis-use of the English language. Not that it is wrongly used or translated, because so far, most interactions have been humorous. I snapped a photo of this sign, which when I first saw it, got a laugh out of its explantation: CAUTION SLIP! Obviously, they meant slippery. However, two days of rain and warm wether decimated the ski area and our race courses and turned what snow was left into either pools of water or solid ice. This sign took on a whole new meaning when watching novice skiers make their way to the lifts and parking lots. I wish I had Warren Miller there to commentate. Tonight is the Individual Race - 15km, 4 shooting stages. So, I am off. Thank you for your comments! It cheered me up immensely! I am feeling 100% better and am thankful that I will travel healthy and rested this weekend. 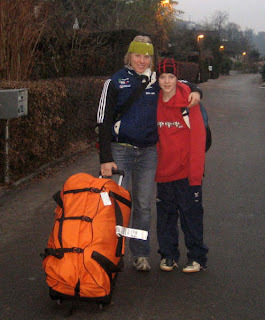 I arrive in Pyeong Chang on Sunday evening, and will keep you updated throughout the competitions. And, I am back in Lake Placid late on February 23rd. Let me know what that next week looks like at school, and I will come and visit. I was anticipating a positive report from Germany this week during my pre-World Champs training camp, but instead am using this as a diversion during an unfortunate day off. My team has been passing around a stomach bug for the last week, and until this morning I thought I was able to stear clear of it. I will spare you the details, but got up at my normal time to only head back to bed and sleep for 5 more hours. Looking ahead at this afternoon, I am still not feeling 100%, so am wondering what to do. A movie perhaps? Anyways, while fiddling around on the internet I found some things that might be of interest. Saturday February 28 from 11:30-1:30 p.m.
(kids come free with an adult) All ages welcome! Learn fun, easy recipes that are healthy and delicious. A class the whole family will love. And on the NPR homepage I found a bread recipe similar to what you find over here. These soft rolls are perfect for using up leftover oatmeal. Leftover oats have had a chance to more fully absorb the water they have been cooked in. They tend to congeal a bit after cooling, and this is good for mixing into the dough. Add the water a little bit at a time, as cooked grains release their liquid as they're mixed into the dough. Serve these with butter, or use them as hamburger buns or sandwich rolls. Makes 16 small rolls . In a large bowl, mix flour with yeast, salt and sugar. Add melted butter and oatmeal to flour mixture, and stir to combine, using hands to break up large bits of oatmeal. Add 1/2 cup water and knead with hands to incorporate. Add another 1/4 cup water and continue kneading, adding additional water by tablespoonfuls if necessary until dough is no longer shaggy and comes together into a ball.. Turn dough onto a clean, lightly floured surface and knead with heel of your hand, turning periodically, until dough is soft, smooth and elastic, 5 to 10 minutes. Place dough in an oiled bowl, cover and let rise until doubled in size, 1 to 1-1/2 hours. Preheat oven to 375 degrees. Punch down dough. Divide into 16 pieces and form each piece into a tight ball, pinching dough together on the bottom of each roll. Place rolls on an oiled or parchment-lined baking sheet and cover with oiled plastic wrap. Let them rise for another 30 minutes, until puffy. Before baking, brush the tops with milk and sprinkle with sesame or poppy seeds, if desired. Bake until tops are deep golden brown, 20 to 25 minutes. I aspire to be able to make bread someday. So, good luck if you gives this one a try! A local backery in Seigsdorf, right next to our hotel. I pass it each morning on my walk before breakfast. Danke -Thank You - ZIS! 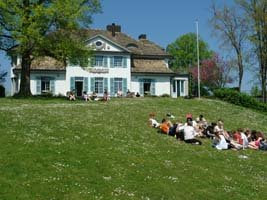 I would like to say thank you for my visit to the Zurich International School Middle School in Kilchberg, Switzerland! I walked to school, through meadows, pastures and a wooded ridge about the Sihl river, with my Uncle - Mr. Hovey - on Tuesday morning from Langau am Albis. The plan was to spend the morning there, using the gym facility for a strength workout and sitting in on one of my Uncle's 7th grade history classes. Upon arrival, there was a flurry of students and faculty, many of whom I was able to meet, and finally put a face and location to many of my Uncle's peers and students. I joined in on Ms. Meier's 6th grade Advisory class (like homeroom) and explained a bit about who I am and what had brought me to Zurich for a few days. Many of them had just watched the previous weekend's competition in Italy, so my visit was timed well. Next, I used their gym to get in a short strength session. I shared the room with some students who were using the space as a quite reading room. Their book: Into the Wild by Jon Krakauer. They were reading in English about the American west. I could perfectly picture the Mojave Desert, the Sierra Nevadas, Alaska, the Grand Canyon and such iconic Western places that are present in this book. Such places are integral to setting the scene of the main character's journey and I wondered what it was like to read the book without also exploring what those places looked like, felt like, or even smelled like. The lakes and mountains of Switzerland couldn't be more opposite. Next, I rejoined Ms. Meier's (the gym and health teacher, who is from California, but now lives with her family in what she called "Heidi-land" just outside of Zurich) health class. I spent the first few minutes of classes telling them about myself, the website that my sister updates for her, my brother and I, and answering questions about my training and how it applied to their health class. A main point was that as an endurance athlete I was training my heart, as well as the my other muscles, to be able to endure long skis, runs and bike rides. This same day, an author of children's and young adult books, Jack Gantos, was also visiting the school. I joined my cousin Sam, whose 8th grade class was was given a presentation on how to write creatively. He had some great ideas- no matter your age - for conjuring up your imagination and to develop your enjoyment of writing. He emphasized communication, as he waved his small notebooks that he wrote his novels in, and the utmost importance of developing the ability to articulate and express your ideas, emotions, opinions and even your funny stories. The day wound down, as I followed Sam around for a bit and also sat in on my Uncle's 7th grade history class. I find it relaxing to listen to teachers and enjoyed being in a class room. In the same room, I ate lunch with some of his students during the next period. A bunch of 8th grade girls. Some shy, some talkative, some American, British, and from families of mixed heritages and languages, which represented the student and teacher community of the school. It was an ecclectic mix of German (in all its many forms and dialects from Switzerland) and English. As quickly as school days begin, they also end. I was back to Langau am Albis where my family lives by earlier afternoon. For a day, it was fun to be back in school. My cousing Sam and I on the way to the train station - he was headed to school and I was off to central Zurich to catch another train to Munich, Germany.